B eginning January 1, 2017, Capital Region Water is the point of contact for Street/Sidewalk Cut Permits in the City of Harrisburg when excavating for water or sewer pipe repairs. 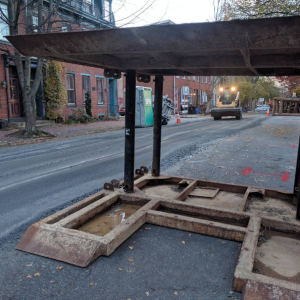 If you are excavating streets or sidewalks in the City of Harrisburg for water or sewer pipe repairs, you need to obtain a Street/Sidewalk Cut Permit through Capital Region Water. Work is not permitted to begin until an approved Street/Sidewalk Cut Permit is issued. You can access the Street/Sidewalk Cut Permit Application packet here. Your Bond in the amount of $25,000 that lists Capital Region Water as the Obligee, not the City of Harrisburg. Submit these items to Capital Region Water by email (info@capitalregionwater.com), by mail, and in person at our Customer Service Center at the address provided below. To avoid work delays, your application should be submitted to Capital Region Water five (5) working days in advance of the anticipated date work is to commence. Payment made payable to “Capital Region Water” must be received prior to permit issuance by Capital Region Water. You can contact the City of Harrisburg by phone (717-255-3091 ) or email (streetcuts@harrisburgpa.gov) with questions regarding the Street/Sidewalk Cut Permit Application or the City of Harrisburg Procedures Manual & Standard Specifications for Street Cut Permits. Once approved by the City of Harrisburg, Capital Region Water will issue you the approved Permit via email. If you do not have email, you will be contacted to pick up the Permit at our Customer Service Center. Work is not permitted to begin until an approved Street/Sidewalk Cut Permit is issued. Do not commence with backfilling of any part of the excavation until a Capital Region Water representative has inspected the site. You must submit a color photograph of the fully restored street/sidewalk cut to Capital Region Water within six (6) months of the permit issuance. If Capital Region Water does not receive a color photograph within six (6) months, you will be charged an additional $250. You are responsible for maintaining the restored street/sidewalk cut area for a period of two (2) years following the date of final restoration.